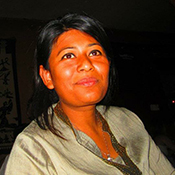 Reshma Thapa, former ICTJ senior program associate in Nepal (2009- 2013), looks back on one particularly poignant dance shared among women in a small village. It is 2010, and I am in the Terai region of Nepal, observing a locally-led workshop on transitional justice. 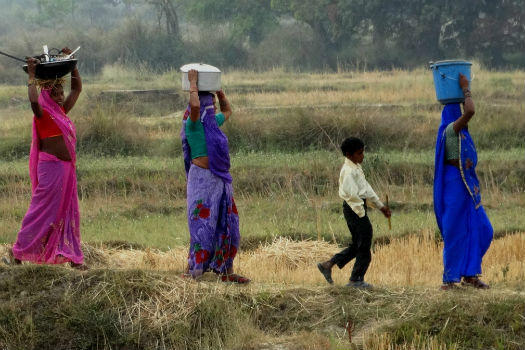 In the Terai, many women suffer from discrimination related to Hindu traditions. “A woman,” the Hindu philosopher Manu once said, “must never be independent.” An apparently ordinary workshop is magically transformed one night when I encounter a woman who shows me how even a small measure of independence can signal joy in the face of sadness. The training took place over four days, and included both men and women who had been affected by the conflict between the government and rebel Maoists that had ravaged the country for ten years. As is common in Terai, because of the presence of men at the workshop, many of the women covered their heads with their saris, using the long piece of fabric that is left hanging behind the neck. Toward the end of our time together, I organized a cultural night so that people could share their local songs, dances, and stories. I noticed that women from the hills, who did not have their heads covered, danced for the group, even though men were present. Those from the plains, with heads covered, would sing songs—mournful songs of loss—but would not get up to perform their traditional dances in front of the men. At the end of the evening, I was closing up the darkened meeting space when I heard a small voice outside calling my name. I peered through the window and saw one of the women, her head covered by her sari, whose husband had been killed in the conflict. Behind her were two older women. Our eyes met. The woman paused, and then—only now did I realize how young she was!—she uncovered her head and slowly began to dance. Her movement was graceful and free. I was transfixed. The older women started to clap and sing and, inspired by the younger one, each of them took turns dancing as the night grew silent around them. I was stunned. Why was she dancing, and dancing for me? I hoped that her dance was born from the space that had been opened during the workshop. Was she articulating a new awareness of her rights, however distant they may have seemed? Was this a joyful statement of her independence? I will never know for sure what the inspiration for her dance was.